Thousands of autistic and disabled schoolchildren have been injured and dozens have died after being restrained by poorly trained teachers and school aides who tried to subdue them using at times unduly harsh techniques, an ABC News investigation has found. With no agreed upon national standards for how teachers can restrain an unruly child, school officials around the country have been employing a wide array of methods that range from sitting on children, to handcuffing them, even jolting them with an electric shock at one specialized school. Some have locked children in padded rooms for hours at a time. One Kentucky teacher's aide is alleged to have stuffed 9-year-old Christopher Baker, who is autistic and was swinging a chair around him, into a draw-string duffle bag. "When I got to the end of the hall and saw the bag, I stood there like, 'Hmmm, what in the world?'" 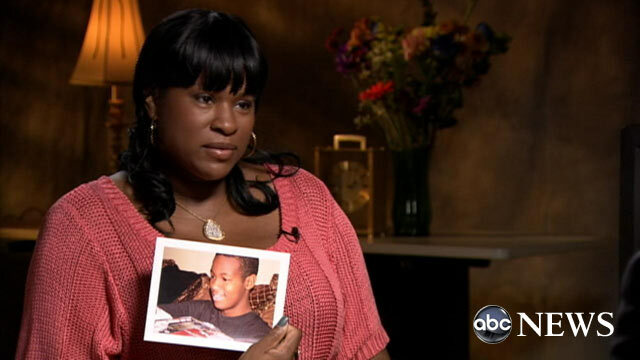 the boy's mother, Sandra Baker, recalled in an interview with ABC News. She had arrived at the school to find her son wriggling inside the "sensory bag." "It was really heartbreaking to walk up and see him in that." Earlier this year, Sheila Foster's son Corey, 16, was the latest child to die at school, when staff members at a special needs facility in Yonkers, New York held him face down for allegedly refusing to get off the basketball court. Sheila Foster said witnesses later informed her that Corey told the staffers he couldn't breathe, but they allegedly persisted, reportedly telling him, "If you can talk, you can breathe." The school said this account is not substantiated. In an interview that will air on "World News with Diane Sawyer" and "Nightline" Thursday, Sheila Foster said she watches the time-lapse security video of her son nearly every day, hoping for a different ending. "Every time just looking at these pictures, I know I won't feel him hug me anymore, or say, 'I love you mommy,'" she said. "That was the last time he was alive and I want to see that." How to safely handle an out-of-control student has been a longstanding issue for parents whose children attend special schools for those with autism or with behavioral or developmental problems. But experts told ABC News it has become increasingly vexing for officials in traditional public schools as they have sought to accommodate children with special needs. Many of the schools provide little or no training to teachers and staff for how to intervene when the student misbehaves. That has left teachers and school administrators to find their own solutions, at times with terrible outcomes. Compounding the problem, some experts believe, is the lack of federal standards for how or when teachers should safely restrain an unruly or violent student. An advocacy group for parents of autistic children found that only 30 states have any laws governing the safe use of restraint on children, and many of those "have loopholes that allow restraint to be used with little limitation." Lobbyists for school administrators have opposed recent efforts by Congress to establish clear federal rules, arguing that decisions about students should be made by school officials, not political leaders. Lawmakers told ABC News they are deeply troubled by recent high-profile incidents, including those a child being locked in a padded "scream room" in Arizona, and other children being handcuffed to railings in a Mississippi school gym. "I'm appalled by it," said Rep. George Miller, a California Democrat who proposed legislation that would create a uniform standard on restraint for the nation's schools – legislation that has failed to even receive a committee vote over the past three years. Until recently, Miller said, no organization even knew the number of deaths that were occurring on school grounds. He said several advocacy groups spent years tried to assess the toll. The Coalition Against Institutionalized Child Abuse, an advocacy group, used public records to tally 75 child deaths between 1988 and 2006 that stemmed from the improper use of restraints. A California disability rights organization, Protection and Advocacy, Inc., counted 39 deaths in just that state between 1999 and 2007, all resulting from the use of seclusion or behavioral restraints. A 2009 study by federal auditors reported hundreds of instances between 1990 and 2009 where improper restraint led to injuries, and another study that same year, by the National Disability Rights Network, chronicled dozens of specific cases of young children, many of them autistic, being suffocated or badly injured while being improperly restrained. "I almost didn't believe the information that we first received from the disability networks," Miller said. "The belief that this was happening to children in institutions, in schools where parents drop them off and expect that they will be kept safe and then all of a sudden you find out that you, your child's life is endangered and in fact your child has been killed." Daniel A. Domenech, who heads the American Association of School Administrators, said the practice of restraining an out-of-control student is an unwelcome but essential part of keeping teachers and other students safe. And the vast majority of the time, he said, school officials are able to subdue a child without harm coming to anyone. "What do they do when the child begins to hurt themselves or when they attack another child?" he asked. "Do they just stand there and watch? They don't. They intervene." Domenech, who once oversaw the schools in Fairfax County, Virginia, said he agrees that more training is needed to prevent teachers from restraining children in ways that are dangerous. He winced when told of schools that stuffed children in sacks or used duct tape to restrain them. "Restraint is something that we won't see or don't want to see put in place unless it is absolutely necessary," Domenech said. "But the problem is the training. The problem is the training." A half-dozen parents whose children died or were injured in school told ABC News they were shocked to learn about the kinds of techniques some schools were using to subdue students who were misbehaving. "All that I was told was that they talk to the students -- you know, try to calm them down," said Foster, whose son Corey, 16, died at Leake & Watts, a school and residential treatment center just outside of New York City. "I didn't know anything about restraint and seclusion therapeutic holds until this happened." A school surveillance video that Foster shared with ABC News shows her son shooting baskets, and then being shoved into a gymnasium wall, surrounded by a group of school staff, and forced to the ground. For several minutes he is at the bottom of this scrum. A gurney can be seen being wheeled into the gym, where a motionless Foster remains on the ground. The school told ABC News that the staff behaved exactly as they were supposed to. "Our staff used various de-escalation and re-direction techniques prior to initiating the therapeutic hold, which was performed correctly and in accordance with the state-mandated protocol," said Meredith Barber, director of Institutional Advancement at Leake & Watts. "We regularly train and retrain our staff in TCI (Therapeutic Crisis Intervention), a crisis intervention technique designed by Cornell University." Barber said she was limited in what more she could say. But she noted that "extensive third-party independent reviews by the police, the District Attorney's office, the medical examiner and state officials support Leake & Watts' own internal investigation and this conclusion: Corey's death was a terrible tragedy." An autopsy ruled Corey's death an accident, saying he suffered "cardiac arrest during an excited state while being subdued." A school in Massachusetts established to provide an education to those with severe developmental disabilities and behavioral problems, called the Judge Rotenberg Center, has repeatedly come under scrutiny for employing electric shocks to students' arms and legs as a means of improving their behavior. Cheryl McCollins said she was mortified when she realized the school had applied shocks to her son 31 times during a single -- and clearly agonizing -- encounter, even though she had initially agreed in theory to the use of skin shock aversion therapy. It took 10 years before courts allowed her to make public a video showing the day her son Andre was shocked by school officials, including while he was on the floor with his splayed arms and legs strapped to wooden planks. She showed the video to ABC News and described what she was looking at. "I see my son being tortured, terrorized by inhumane, criminally insane, out-of-control savages," she said. Officials at the Judge Rotenberg Center said the treatment was approved both by Andre's mother and by a court official, and the electric shocks have proven effective in improving the behavior of children who are prone to harming themselves or are violent to others. They said the student body at the school is comprised of some of the nation's most troubled children, those who have already failed to succeed in more traditional programs. Mariellen Burns, a school spokeswoman, said the school has changed its procedure since the episode involving Andre occurred 10 years ago. Today, skin shocks are applied less frequently, and students would not be shocked while bound to a wooden board. That said, the school continues to use electric shock as a method for changing the behavior of some children who fail to respond to less extreme measures. "I do want to emphasize that behavioral skin shock treatment is effective and necessary in some cases," Burns said. "It was a necessary and effective treatment for Andre." Other parents who have children at the Rotenberg Center strongly support its methods, saying the school's mix of treatments – including the use of skin shocks – has succeeded in ways no other treatment has. One mother, whose statement was provided to ABC News by the Rotenberg Center, said her son's violent outbursts made it impossible to be safe in his presence. Since starting the treatments, she said, he has been transformed. "To those who routinely use false and inflammatory words to describe the only therapy that helped my son and has given him a life – shame on you," she said. READ the full statement from the Judge Rotenberg Center. The restraint issue is not just the province of specialized schools such as the Rotenberg Center. Increasingly, experts tell ABC News, incidents involving the improper use of restraint are occurring at mainstream public schools. Domenech said the reason for that is the passage of laws in the 1970s that required public school systems to move children from facilities "where in some cases, my god, they were treated like animals, and brought them back into the schools, with the proviso that these youngsters would be educated in the least-restrictive environment." Because many of these youngsters have "behavioral issues," said Domenech, "they tend to act out. And when they do act out, sometimes they become a danger to themselves or a danger to others. And it's the responsibility of the school superintendent to ensure the safety of all of our students." This year, amidst mounting evidence that the improper use of restraint was leading to injuries and deaths, the U.S. Department of Education for the first time released its own guidelines for the use of restraint in American schools. The report concludes that there is "no evidence that using restraint or seclusion is effective." "The principles make clear that restraint or seclusion should never be used except in situations where a child's behavior poses imminent danger of serious physical harm to self or others," wrote Arne Duncan, the U.S. Secretary of Education. "And restraint and seclusion should be avoided to the greatest extent possible without endangering the safety of students and staff." In his interview with ABC News, Domenech acknowledged that not every school official has used the best judgment in tackling that challenge. Earlier this year a school in Mississippi was ordered by a federal judge to stop handcuffing students for hours for such minor offenses as dress code violations, and to stop forcing them to eat lunch while chained to railings and to call for help when they needed a bathroom break. Officials at the Southern Poverty Law Center, which brought the suit, told ABC News the practice was part of a profoundly dysfunctional school culture. In a deposition, the school's principal, Marie Harris, said she only handcuffed children to keep them safe – for instance, to prevent them from running into a busy street. In Kentucky, Sandra Baker has taken her son out of the school that tried to subdue him by stuffing him in a duffle bag. "It's really sad and it breaks my heart," Baker said. "He went back to school for a month or two, but I had to put him back on home school. He's had a rough time. He says he hates school, he doesn't like the teachers." Kentucky schools spokeswoman Becky B. Holt told ABC News in an email that the media have drawn "mistaken conclusions" about the duffle bag incident. However, Holt said, the administration of the Mercer County Schools "is not at liberty to even attempt to educate the public on the facts" because of confidentiality rules. One school that is trying to find alternative – and less dangerous -- ways to resolve outbursts from students is Centennial School of Lehigh University, located in Bethlehem, Pennsylvania. The director of the school, which serves children with special needs, is Michael George. He told ABC News restraint is being grossly overused in American schools, and is unnecessary in all but the most extreme cases. "I had no idea how prevalent, how commonplace it was," George said. "And I've come to learn it's very commonplace." He said he's heard plenty of horror stories from his own students, many of whom moved to Centennial from mainstream public schools after incidents involving misbehavior and violence. Jordan, an 11-year-old student, described for ABC News what would happen at her previous school when she started to act out. "They'd grab you by your wrists, and they would intentionally drag you to a room and they'd lock you in there and it was dark, there's no windows, and you're just stuck in there for the whole day," she said. George said he had not heard that Jordan had been locked in a dark room for the entire school day. "It is horrible is what it is. It is absolutely horrible," George said. "Someday I think we are all going to look back and say … can you believe what we did here? Why did we do this? What were we trying to accomplish?"